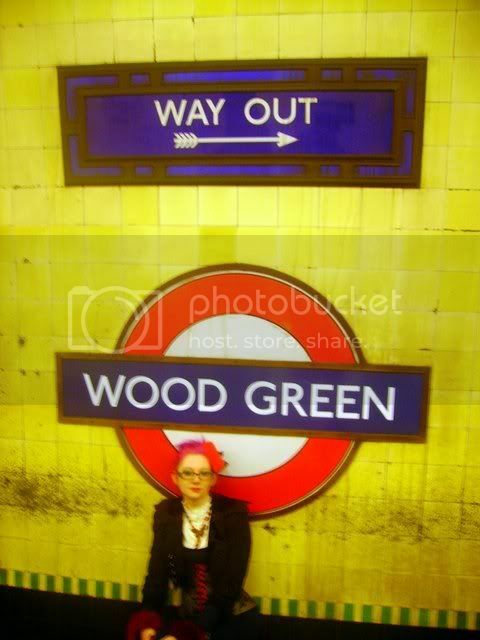 So, after a brief stop in Bounds Green we trundle back down to Wood Green. Home to BBC rehearsal rooms etc. As soon as we pop out upstairs I notice a bevy of hi-vi jacketed police, and in these security conscious times, wonder if this will prove an interesting occasion. I am not to be disappointed. Not living in London myself anymore, I hadn't seen the poster campaign urging Londoners to report people taking pictures of landmarks. Seriously, what the hell is going on? We seemed to have slipped sideways into Eastern Europe during the cold war where we're being encouraged to rat out the hordes of Italian exchange students taking photos of Nelson's Column. There seems to be plenty of online backlash, but in all seriousness this new approach of civilain surveillance is desperately concerning. Who needs terrorists when we just have media hysteria to do all their work for them. 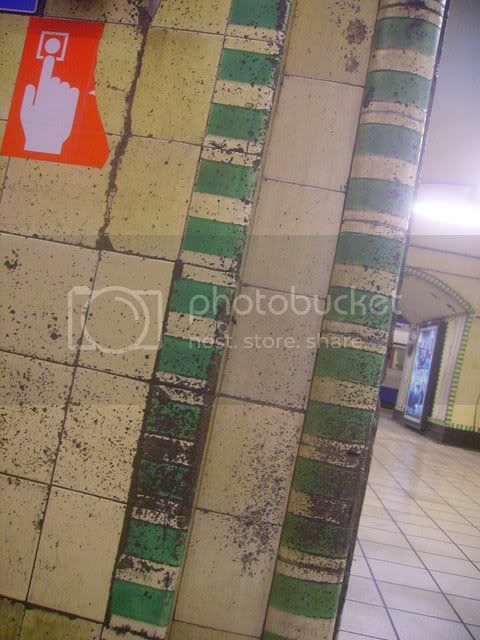 Amusingly, back underground - where we take loads of pictures thankeeverymuch...I spot a page from 1984, which has been photocopied and stuck up around the platforms; how very apt. 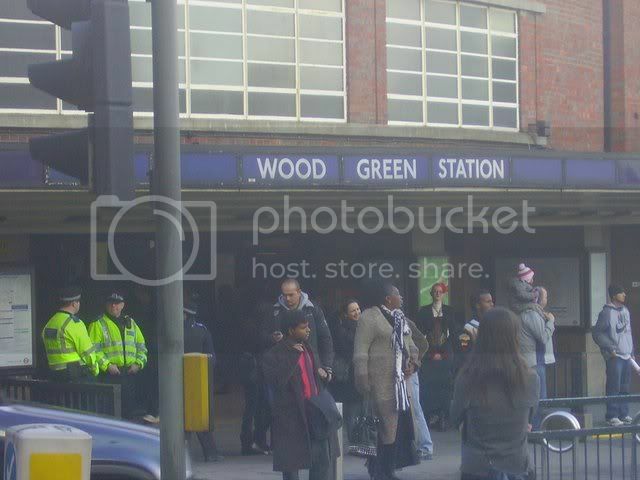 ...this does mean that exterior shots of Wood Green were limited to what we got before police intervention...when I do Arnos Grove and Southgate, I'll get more wide shots of the Wood Green station itself as it's rather lovely. 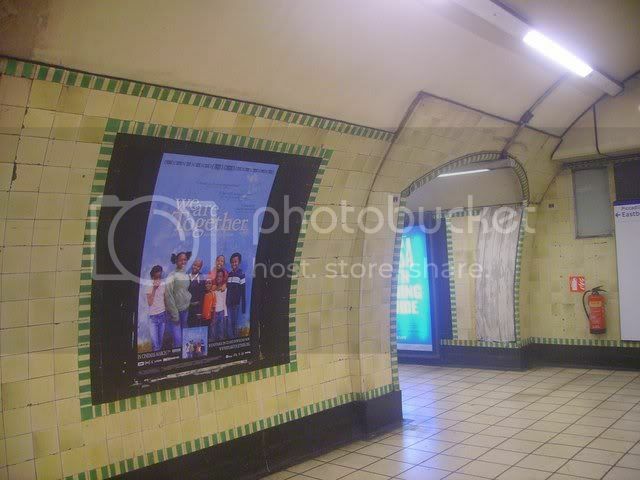 It's now discouraged to take photos of PUBLIC landmarks in London? Why on Earth would that be? ...but yes, on one hand amused to be seen to be so dangerous to democracy, and on the other bloody pissed off at how basic civil liberty to gurn at the camera is being treated as threatening. We are being cowed by degrees...and not enough fuss is being made about all the crap that is being imposed on us, all the surveillence carried out, in the name of this nebulous need for 'security'. Not living in London myself anymore, I hadn't seen the poster campaign urging Londoners to report people taking pictures of landmarks. This is absofuckinlutely appalling. I'm going to link to this article. The taking photos thing is just... depressing. Do you mean that after the coppers talked to you, writing you up and everything, you weren't allowed to take photographs afterwards? Even after explaining? 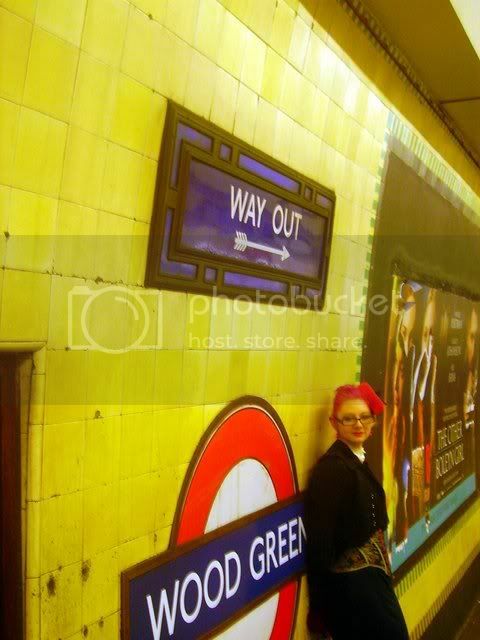 I don't think we'd have been arrested, but by that point we figured we had what I needed and went off to take platform shots. 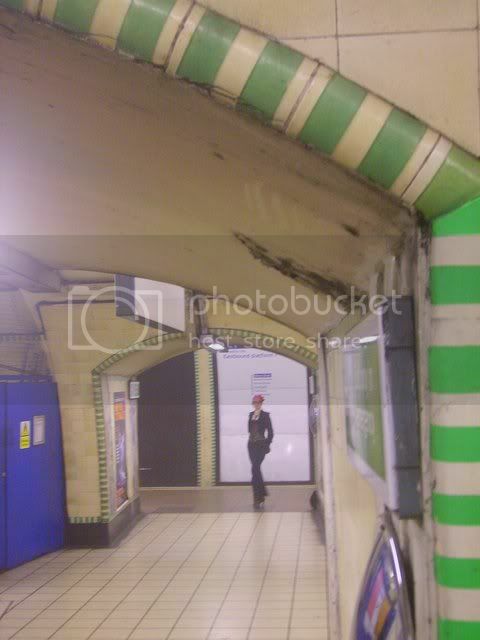 Only remembered after that I'd have liked a full shot of the station itself. It's a very depressing, although equally I haven't encountered any aggro from it thus far (I'm half hoping that I'll get someone say something in response). ...it's getting harder to be conspiciously weird, y'know. What with goths getting beaten to death, and everyone so jumpy about 'security', where's the fun? Where's my freedom to carry on the tradition of Great British Eccentrics gone? Just wondering, was the Stop issued by a PCSO? AIUI PCSOs can only Stop if under the supervision of a proper policeman, unless it's for anti-terror reasons. If it is for anti-terror reasons, taking photographs of a public place are not reasonable grounds. What was the reason given on the paperwork for the Stop? LOL...but then most coppers on the beat aren't there for their intelligence as proven by the link. I agree that in a court of law he really didn't have "reasonable grounds". But I've been hit by a policeman's nightstick before (in the face) and decided just to answer his questions and laugh it of. If you see foreigners taking photographs please call the anti tourist line. I have the anti terrorist phone number saved on my mobile... people were asked to do this presumably in case we overheard terrorists making dastardly plans. Although I think if I ever was in that situation I'd be calling 999 at the first safe opportunity. I have an idea that once through to the anti terrorist line I would find it to be menu driven and I'd be invited by a recorded voice to "Press 1 if you suspect an attack is imminent, press 2 if it is in the planning stages, press 3 if you want to give yourself up..." I franticly press 1 then get the next menu "Please press 1 to report Islamic fundamentalist activity, press 2 for anarchists, press 3 for separatist movements, press 4 for..." by then the bad guys would have noticed me and fled... or worse. Somewhat surprised to discover from your link, that having two mobile phones marks people as a potential suspect... I carry two mobile phones pretty much all the time now. Why... well one has wifi and the other has a better interface for playing chess. I know other people who have a work phone and personal phone on them. Given that I carry two phones, a phone/data-capable PDA, a Leatherman, camera and often assorted other tools I am clearly a dangerous terrorist and should hand myself in immediately. On the other hand, since as far as I'm aware we haven't yet lost the War On Stuff I'll continue carrying everything as part of my own fight against the Evil Ones (whichever side they claim to be on). And I love the LOLcat poster on that link! Blimey. That is bloody ridiculous. Those interior shots are lovely. I see what you mean about London being a little grubby round the edges. Here via juggzy too. Some laws are dumb, especially lots of new ones - but too often so are the people enforcing them.